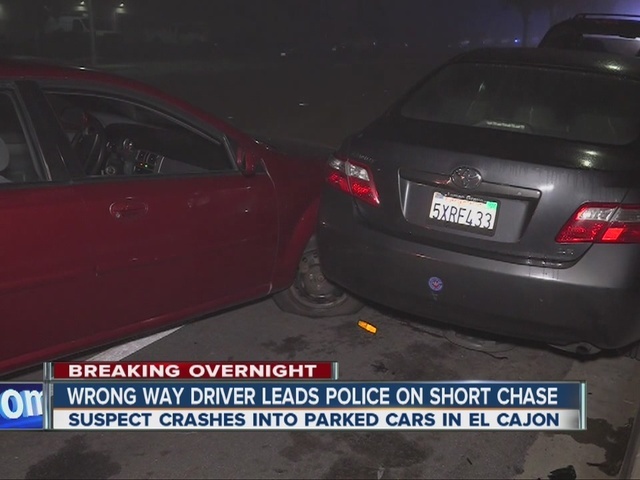 A man suspected of driving the wrong way through the streets of El Cajon crashed and was arrested after trying to hide from police. At about 12:30 a.m. Monday, officers observed a man driving the wrong way on E. Madison Ave. and attempted to stop him near 3rd St. However, the driver turned his lights off and continued as officers pursued him. Officers lost sight of the car due to the fog. Minutes later, the car was spotted on Broadway near Grape St., where it crashed into two parked cars. The driver ran away and hid under an RV a short distance away, but he was taken into custody a short time later.